Janelle Johnston is the only organically certified grower of edible flowers in Australia. About 15 years ago she certified 16 acres of her family’s 120-acre farm on the outskirts of Byron Bay with ACO and has grown organic fruit, vegetables and edible flowers ever since. With a science degree specialising in Botany, Janelle featured nasturtiums and marigolds in her salad mixes, inspiring local chefs to request other organic edible flowers as no one else in the region was doing it. She now supplies to the Sydney and Brisbane wholesale markets. 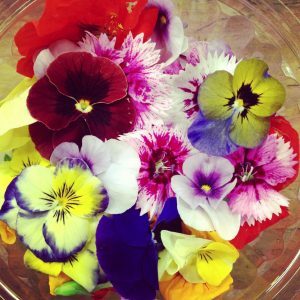 The edible flowers can last for up to 12 days if picked and packed on the same day and properly refrigerated throughout the supply chain. Janelle packs the flowers in sealed 20-gram punnets to retain freshness, which retail for $8 to $10. Some flowers like violas and pansies are sold in a 10-gram punnets as these are very light flowers and difficult to pick. Janelle uses her website – www.byronbayorganicproduce.com.au – to market this niche enterprise and educate people about edible flowers. Cafes are turning to edible flowers to bring beauty, fragrance and colour to dishes and create the awe-inspiring reaction from customers. “We use edible flowers purely for aesthetic reasons. We’re the only cafe I know in the region doing it, and it has become our signature thing,” says Sara Gleeson at Naked Treaties in Byron Bay. Melbourne florist, Lindsey Myra, says she entered the cut flower industry to make a difference. Established in 2012 as The Urban Flower Farm in a Melbourne backyard, the business is the first of its kind in Victoria, with heirloom varieties preferred, companion planting standard practice and no genetically modified seed or bulb stock purchased. “I was very concerned about the environmental impact of our industry. I was also disillusioned by how “disjointed” our idea of giving flowers has become. I was motivated by the desire to see different things being produced,” she says. Lindsey says the success of the farm hinges on getting the product to the right people. “I use the terms “lovingly home grown” and I market an idyllic, abundant lifestyle, overflowing with old fashioned flowers,” she says. To make this business as financially viable and as authentic as possible, Lindsey says the key is to have as fewer links in the supply chain as possible. In the future she aims to create a CSA (community share agriculture) program for getting flowers direct from farm to flower lover. “It will work like a veggie box in that you go online, select a value and how often you would like to receive flowers and then once a week I come to town and distribute whatever is happy, healthy, seasonal and blooming at the time,” says Lindsey. Lindsey says that there is definitely scope for more locationally-specific small to medium-sized organic cut flower and edible flower markets.